Welcome to St. Petersburg airport. 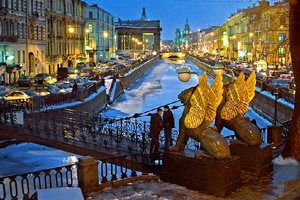 As part of St. Petersburg private tour you will be met by a private driver and transfered to the hotel. The rest of the day is at leisure. If you arrive early in the day we might suggest some optional activities. Overnight in St. Petersburg. 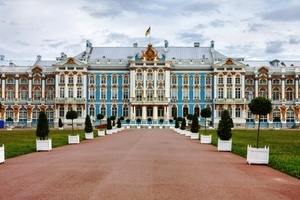 In the morning you will be taken on a sightseeing tour of St. Petersburg. You will drive by the elegant buildings on the Nevsky Prospect, Kazan Cathedral, Admiralty, Strelka, Rosstral Columns, Fontanka, Canal Griboyedova, the Palace Square, Winter Palace, Summer Gardens and other remarkable landmarks. After breakfast visit Peterhoff (formerly known as Petrodvorets), located on the southern shores of the Finnish Gulf 14 miles away from St. Petersburg. 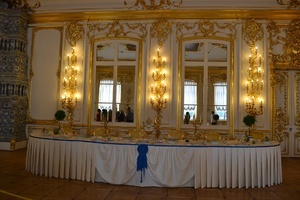 The Grand Palace with its lavish interiors, gilded decorations, mirrors, and paintings dominates the estate. The Park outside the Grand Palace is a kingdom of 144 unique fountains, all operating without the use of pumps by a combination of naturally generated water pressure and magic. Take your time and walk leisure around the park. You will admire the splendid beauty created by a man. The estate includes several other mini-museums of interest. The outwardly-modest Monplaisir Palace, which Peter I preferred to the Grand Palace, has a nice sea view and several rooms of interest, such as the State Hall where Peter would force his guests to drink enormous quantities of wine until they passed out. 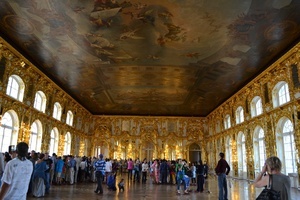 The nearby Hermitage Pavilion, which also has views and artwork, is a two-storey dining room where guests sitting on the upper floor ate and drank in peace, occasionally lowering the table to the ground floor where servants refilled wine glasses and replaced dirty plates. 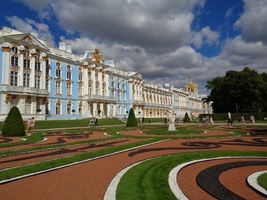 After breakfast - all day tour to Pushkin located 25-30 km from St. Petersburg to visit Pushkin's palaces and parks created under Empresses Elizabeth and Catherine the Great between 1744 and 1796. 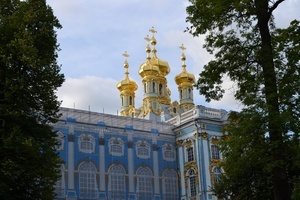 The main landmark is the Catherine Palace designed by Rastrelli and a famous Amber Room inside the Palace. Pushkin's original name is Tsarskoye Selo (Tsar's Village). It was renamed in 1937 after Russia 's famous poet who used to study here. 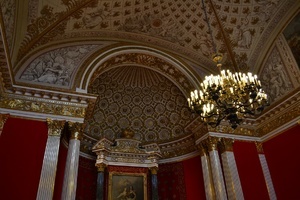 If you wish to see more that St. Petersburg has to offer, we recommend extending your tour by one night and one day. In this case, the guide will take you Peter-and-Paul's Fortress, the State Russian Museum, Faberge Egg Museum located in a beautiful palace. You will also enjoy the views of elegant buildings and palaces from aboard by taking a short canals and rivers cruise. The cost of additional 1 day/1 night package starts at $250 for additional night and sighseeing, depends on the hotel you stay at.